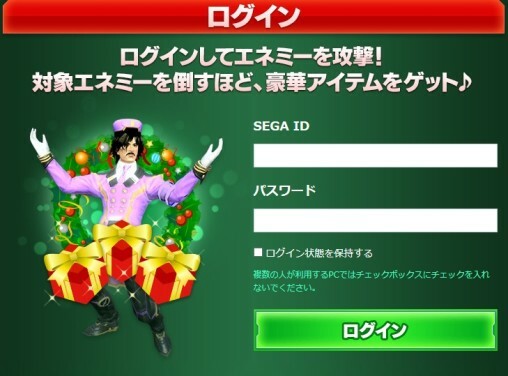 Sega misstated one of the rewards listed for December 22nd. The actual reward should read “+5% Affixing Boost Period.” They apologize for the error and corrected the mistake on December 14th @ 11:30 JST. In celebration of winning the PlayStation Network Award in the [2015 PlayStation Awards], Sega will be holding a boost event that raises the rare drop rate for all quests! In addition, several items will be delivered to all players, which can be picked up from the Visiphone. +100% Rare Drop Boost for All Quests! The following items were distributed in the previous maintenance. Players who did not receive all the items they qualified for. Merry Christmas, everyone! With a new year just around the corner, it’s time to begin the holiday festivities. Even Dudu is in on the fun, ready to deliver gifts to all the good players who participate in the X-Mas campaign. The event begins on December 14th, tasking players with defeating a certain enemy each day. If the mission is successful, we’ll unlock prizes that will be distributed in late December. 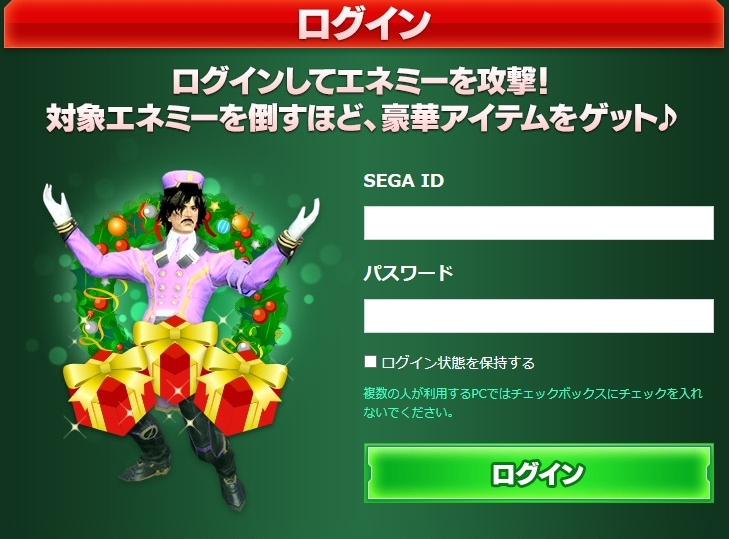 Enter your SEGA ID and Password. Press the green ｢ログイン｣ button to continue. Click on the button labeled [PUSH] to damage the enemy. You can click on this button up to 5 times a day! Click the [Push] button again to [Retweet] the campaign on twitter. Doing so deals even more damage to the enemy. You can perform this action once per day. 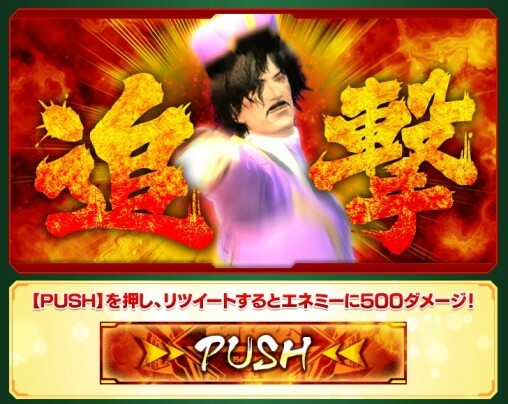 Players can earn various prizes by participating in defeating the enemy. Players can also qualify if they attack an enemy that was already defeated earlier in the day. Players will have until 23:59 JST of the appointed day to qualify for the prizes listed on that day. ※ Only players who log in through the Campaign’s website and press the button to damage the enemy will qualify for the prizes on that day. Merely retweeting the campaign’s tweet outside of the campaign’s official site will not qualify you for the prizes listed for that day. ※ Reward Items and Boost Periods will be released in the future. ※ Failing to defeat the enemy will disqualify everyone from receiving the prizes for that day. Late December for the qualified items and boost events. This blog is amazing! Thanks Ricardo for the info! I was wondering why I was unable to log in today. Dark Falz Apprentice Gia Awakens December 22nd!